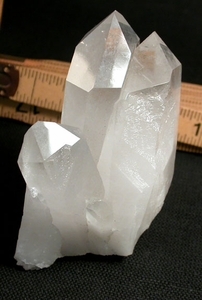 Arkansas milky to devic veils to clear cluster features a great tabular crystal with slightly skewed Isis face plus three more, each with suede-like growth marks and silky smooth sides. 1-1/2x 3x 3-1/2" tall, stands alone on a Hera [self-healing] base. Two small chips which do not detract, a fineline uncommon 7h face to the right of the Isis.